The Southeast Asian nation has friendly relations with all the key players. 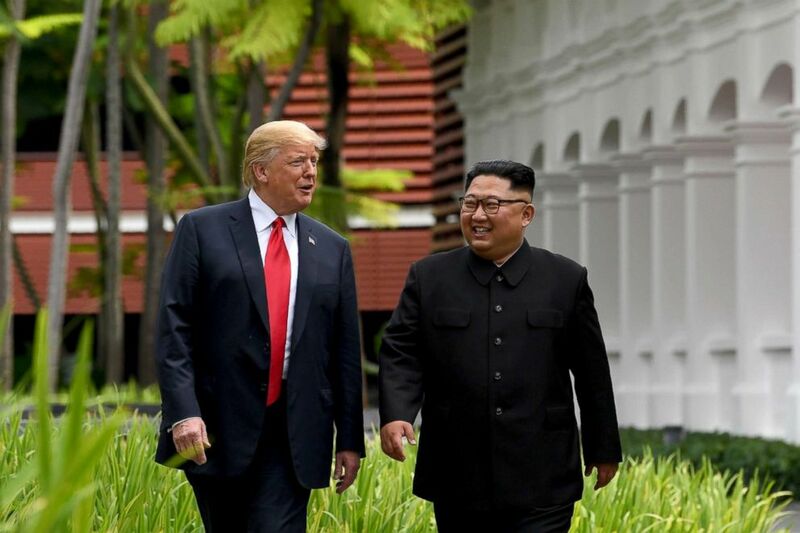 Vietnam will host the second summit between President Donald Trump and North Korean leader Kim Jong Un later this month, Trump announced during the State of the Union on Feb. 5, throwing a spotlight on the Southeast Asian nation that has friendly relations with all of the main players. Trump said during the State of the Union address that he would meet Kim on Feb. 27 and 28, tweeting a week later that Vietnam's capital, Hanoi, would play host. A spokesperson for Vietnam’s foreign ministry said in a tweet Wednesday that the country welcomed the summit and “strongly supports” dialogue on peace, security and stability on the Korean Peninsula. "[Vietnam] stands ready to actively contribute to [and] cooperate [with] relevant sides to ensure” the summit’s success, the tweet continued. The United States and Vietnam normalized ties in 1995, decades after the end of the Vietnam War. Over the ensuing quarter century, their economic and trade relations have grown stronger. From 1995 to 2016, bilateral trade grew from $451 million to nearly $52 billion, according to the State Department. (Andrew Harnik/AP) President Donald Trump, left, and Vietnamese President Tran Dai Quang shake hands at the Presidential Palace, Nov. 12, 2017, in Hanoi, Vietnam. President Barack Obama visited Vietnam in 2016 and Trump attended an international summit there in 2017. 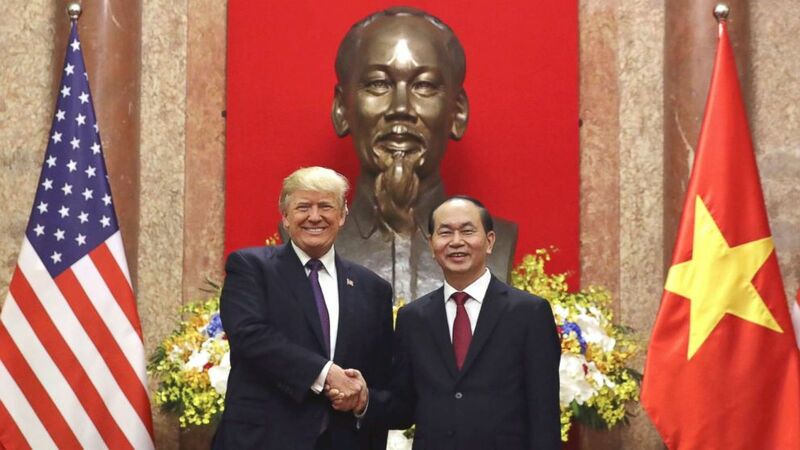 Vietnam’s Prime Minister Nguyen Xuan Phuc visited the White House in 2017, too. South Korea and Vietnam normalized relations in 1992, and they’ve built similarly strong ties anchored on a high volume of trade. Vietnam was South Korea’s fourth-largest trading partner last year, according to Vietnamese and South Korean media reports. North Korea and Vietnam, meanwhile, have maintained relations far longer — since 1950 — and share a socialist ideology and histories of command economies. Vietnam has opened up markets and avoided leadership as concentrated as the Kim dynasty, though. (SeongJoon Cho/Bloomberg via Getty Images, FILE) Motorcyclists travel along a road in Da Nang, Vietnam in this Nov. 11, 2017 file photo. What’s in it for Vietnam? Hosting such a prominent diplomatic event would give Vietnam a chance to showcase its economic success and geopolitical relevance. In addition to its ties with the Koreas and the United States, Vietnam boasts partnerships with Russia, China and others. It’s hosted high-level international gatherings before, including a World Economic Forum meeting in Hanoi in September and an Asia-Pacific Economic Cooperation summit in Da Nang in 2017, which was attended by world leaders including Trump. "Vietnam’s top priority is to ensure that the logistics and security for [the] second summit run smoothly," Carlyle Thayer, an expert on Southeast Asian politics, told ABC News in an email. The hosts, he said, "will pull out all the stops." 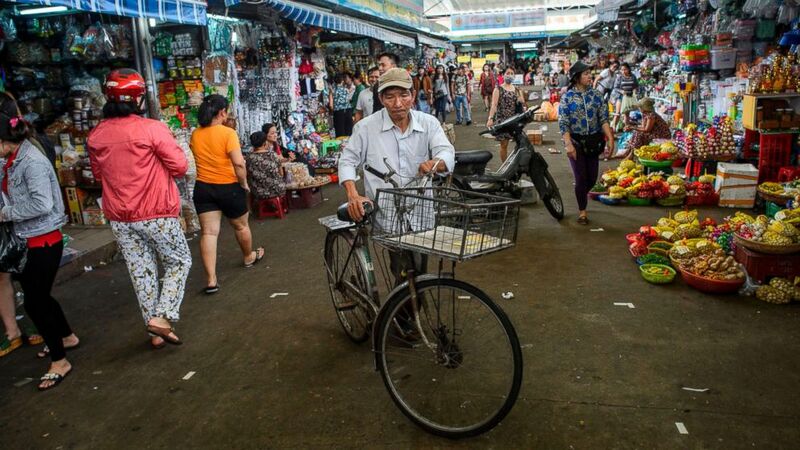 (Ye Aung Thu/AFP/Getty Images, FILE) A man walks with his bicycle in the Con Market in the central Vietnamese city of Danang in this Nov. 11, 2017 file photo. Vietnam is also often lauded as an economic success story that North Korea could emulate. Secretary of State Mike Pompeo made that case in June in Hanoi, when he pointed to the country’s evolving relations with the U.S., which went from fighting to a partnership. (Saul Loeb/AFP/Getty Images) North Korea's leader Kim Jong Un walks with President Donald Trump, left, during a break in talks at their historic US-North Korea summit at the Capella Hotel on Sentosa island in Singapore, June 12, 2018. 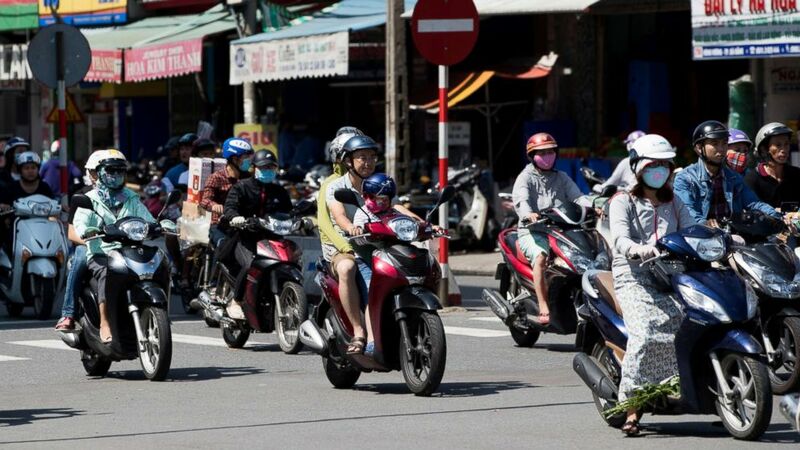 Hanoi's accessibility, five-star accommodations and history with hosting summits made it a prime candidate for this round, according to Thayer, an emeritus professor at the University of New South Wales, Canberra, at the Australian Defence Force Academy. It’s also close enough to North Korea that Kim’s reportedly aging aircraft could take him directly there, Thayer said. Meeting in Vietnam’s capital raises protocol questions and, at least optically, could formally elevate Kim’s visit, during which he would presumably meet with Vietnam’s leaders, according to Thayer. 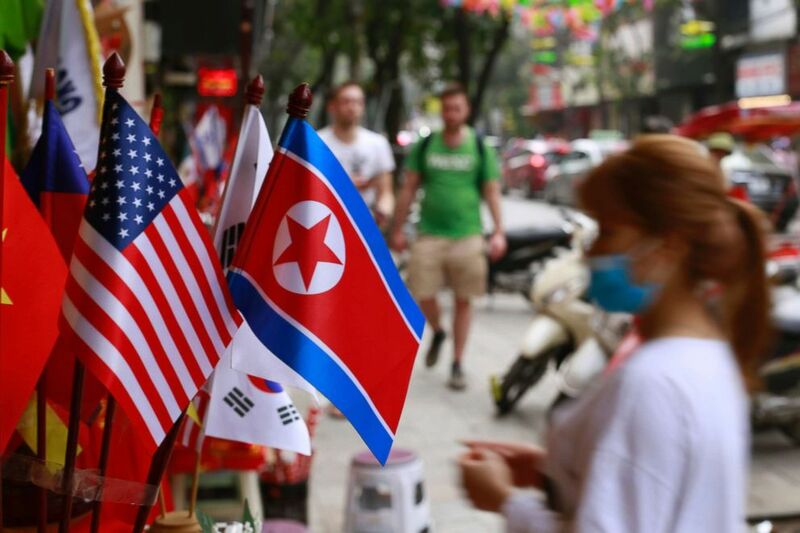 (Hau Dinh/AP) U.S and North Korean flags are on display for sale at a flag shop in Hanoi, Vietnam, Jan. 29, 2019. Like Singapore, Hanoi has a North Korean embassy, which Thayer noted could provide logistical and administrative support to Kim. “I surmise this was a U.S. concession to meet Chairman Kim Jong-un’s preferences,” Thayer said in an email.